Over the last 6 months, the Fund has been working with key stakeholders to identify future directions to help us make a contribution to regional food and nutrition security and to support Federal, State and Territory Governments with their aid, economic diplomacy, biosecurity and trade goals. 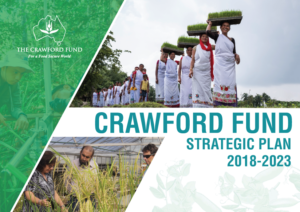 This has culminated in the publication and launch of the Crawford Fund Strategic Plan 2018-2023. 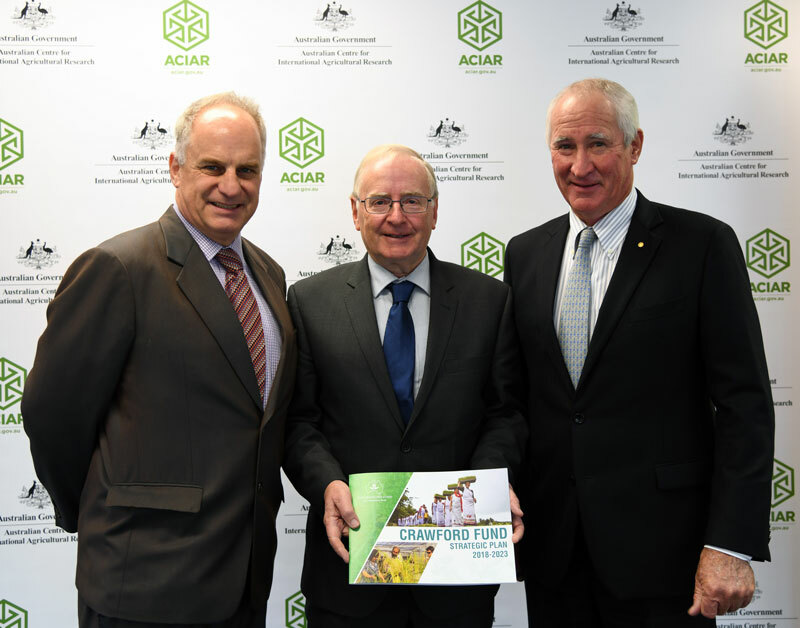 The plan was launched on 5 June with a presentation by Dr Colin Chartres, the Fund’s CEO, at a meeting of ACIAR’s Commission for International Agricultural research. The following piece, co-written by the Fund’s Chair, The Hon John Anderson AO and CEO, Dr Colin Chartres, highlights some of the key messages in the plan. The Crawford Fund Strategic Plan 2018-2023 recognises that the environment in which we operate has changed over the last 20 years. Today, the growing global population, particularly in developing countries, still sees almost 1 billion people undernourished, resulting in physical stunting and intellectual diminishment. Food insecurity can also lead to civil unrest in both rural and urban areas. Poor nutrition choices have also led to a further 2 billion people becoming overweight and obese in both developed and developing countries with concomitant increasing health care costs. What, in the mid to late 20th century, was a global R&D quest to reduce numbers dying from starvation has today become a challenge to provide growing populations with safe and nutritious food in an environmentally sustainable manner. This has to be achieved under changing climatic conditions and in environments where water scarcity and competition for water from non-agricultural users are major factors. To this end, our future focus will emphasise food and nutritional security and sustainable production systems. The Fund also adheres strongly to the premise that agricultural development is a major driver of GDP growth in the poorer developing countries. However, frequently the role of women in this area has been overlooked. Consequently, we strongly endorse equality of opportunity and empowerment of women in agriculture because this leads to improved nutrition, better education of girls, and ultimately to reduced population growth. On a global scale, Australian foreign policy has increasingly focused on the Indo-Pacific region, the system of international agricultural research centres faces ongoing threats to funding, the contribution to international agricultural R&D from the BRIC countries (Brazil, Russia, India and China) has grown and the private sector has become increasingly important in managing and controlling food supply and value chains. Trade in agricultural commodities and food has increased dramatically and, with it, concerns about biosecurity. The Fund recognises the need to focus on the Indo-Pacific region, but will continue to work elsewhere when a compelling case can be made. We will also endeavour to work more closely with the private sector, which is in control of many food value chains, and maintain a strong focus on biosecurity in our training efforts. Given the Crawford Fund’s limited size and resources, our role has to be complementary to other Australian research agencies and funding bodies. Our key activities include capacity building for Australian and overseas research institutions and research professionals; and public outreach. Capacity building is achieved through our subject-focused Master Classes, targeted training for professional technical and managerial staff and farmers, and our growing mentoring efforts. In particular, we recognise that if Australia is to continue to have a strong voice in international agriculture, we have to ensure that young Australian students, researchers, farmers and managers are supported and exposed to the international agricultural system. To do this, with ACIAR’s support, we are strengthening our assistance to our RAID (Researchers in Agriculture for International Development) Program, which now has over 650 members. And we are maintaining our Conference Scholarship and International Agricultural Student awards. Building on our 2014 Review of Master Classes to increase the number of Australian and overseas women and men receiving early and mid-career professional development in high priority areas including research leadership and management, biosecurity and market access, agribusiness, sustainable intensification (including soil, land and water management) and cross-cutting issues such as communication. Developing a strong mentoring program which will see the linkage of senior professionals from Australia with key overseas agencies to enhance capacity development of overseas professional agricultural researchers and managers. Maintaining our scholar program and student awards run by State and Territory Committees to further assist our efforts in developing the current and next generation of agricultural researchers in Australia. Contributing to informed public debate via our Annual Conference, public fora, occasional, but timely policy and discussion papers, briefings and extensive media coverage. Recognising and publicising achievement in international agricultural R&D through presentation of the Crawford Fellowship, Crawford Medals and Derek Tribe Award and the appointment of patrons. Increasing media awareness of the impact and benefit of the work underway around food and nutrition security through our journalism award and ‘seeing is believing’ journalist visits, and bringing a media focus to international visitors and events related to food and nutrition security. Liaising with ACIAR to develop synergistic training and public awareness programs that add value to ACIAR projects and build alumni networks that enhance soft diplomacy outcomes. None of the above would be possible without ongoing support from ACIAR, State and Territory governments and other donors, to whom we are extremely grateful. Similarly we are indebted to our many partners in Australia and overseas, who help facilitate and deliver outcomes of benefit to many.